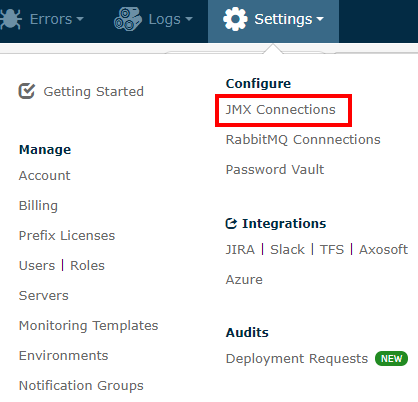 Here are instructions on how to add you JMX connection in the Retrace portal so you can view and create monitors around MBeans on your applications. To start go to Settings > Configure > JMX Connections. Add the appropriate device that corresponds to the JMX connection to the Selected Devices panel. Finally, click "Insert" to save the connection. Stackify will automatically try to see if Tomcat has any existing JMX connections not using a username and password. If a new connection is available, this connection will be added and stored into your Stackify account under JMX Connections in Settings of the Stackify portal. Note: Auto-Discovery of JMX connections currently only work with Tomcat connections and a generated connection name will be given. You will also need to add some external jar files to the Stackify configuration file, as shown below. Note: Stackify must have read privileges on the jar files as well as execute privileges on all directories in the path. Here is a sample of what the STACKIFY_AGENT_EXTERNAL_JARS= should look like. After the JMX connection is created and Stackify discovers a Web App, either through auto-discovery or manual configuration, Java MBeans are added by default to better monitor the JVM. MBeans that monitor the Classes, Threads, Memory and Garbage Collectors of the web app are added automatically using MBeans smart defaults. To learn how to add other non-default MBeans to customize monitoring of your App, see the section about App Monitoring in the App Dashboard Overview article.